Guess what? I still have random vegetables growing in my garden. But my basil plants are at their tail-end. So I decided to make a huge batch of pesto sauce using the Simply Healthful recipe. Since the recipe doesn’t require any cooking, I decided to use freezer jars to store the sauce for future use. And to make good use of my extra freezer that I bought over the summer. Also, it only took me about 20 minutes to do the whole process. I made it while dinner was cooking. 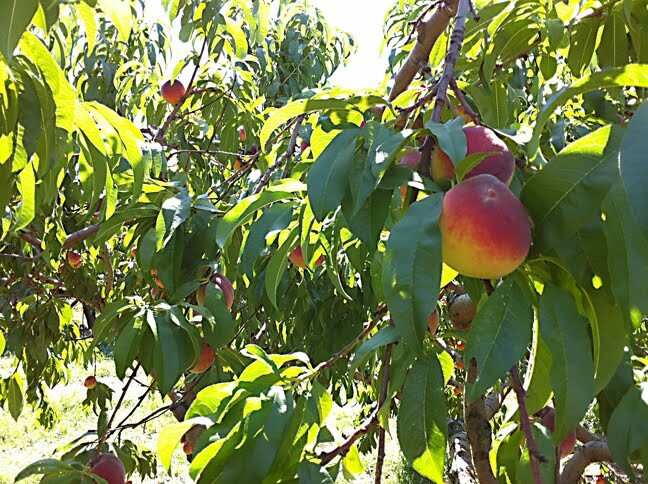 I slaved over my peaches this weekend making jam. I had to act quick. Mold was setting in, and I had to throw out about 10 peaches. So, with sweat dripping from my hot kitchen, I peeled then pureed then canned 20 jars. A mistake I learned…don’t make three batches at a time. The fruit pectin doesn’t set well and my jam turned out a little runny. Or maybe because I pureed it (my kids don’t like chunks). Either way it tastes so good. I added a pinch of nutmeg. Yum. And come to think of it, I actually like how it’s a little runny. It tastes good as an ice cream topper or syrup. I used half-pint jars for giveaways. To make a fabric jam topper: cut a 6-inch square of old fabric. Fold your fabric square into half, and then fold it into half again. Cut along the open edge in an arched shape, creating the outline of a quarter circle. Center the fabric over the jar and place a rubber band over the fabric. I like to use newspaper elastics. You could wrap ribbon around the jar to make it tighter and add a little detail. Either way, homemade jam always makes a nice gift. We were out doing our annual summer fruit picking yesterday. There is a great orchard near our house that has a variety of fruit each month for “pick-your-own”. 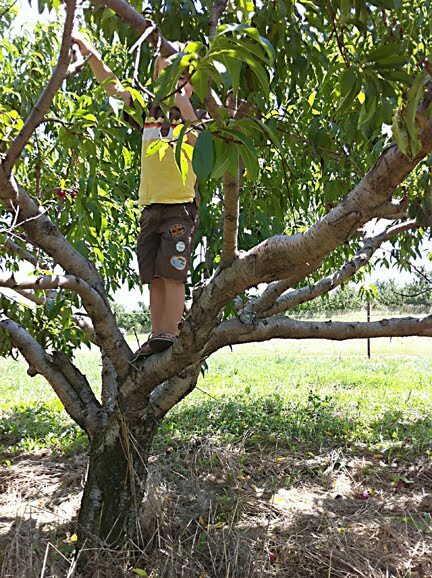 The two older kids were more of a help this year than last and did most of the picking and even climbed the trees to pick the best-looking fruit. We got peaches, nectarines and blueberries. With an abundance of fruit, it forces me to make jams and bake pies and can fruit. This little guy has to take his cars EVERYWHERE we go. Two, of course. One for each hand. 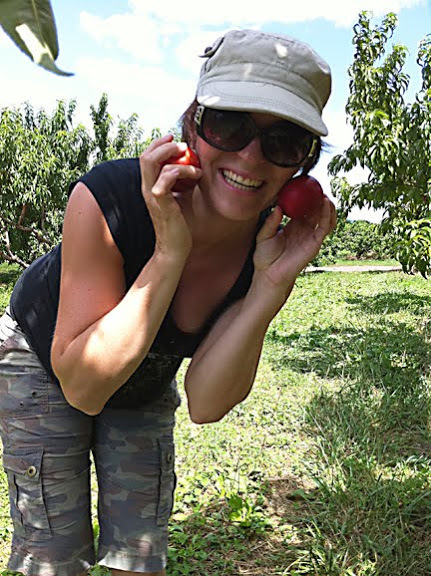 Me and my nectarines and prego belly. 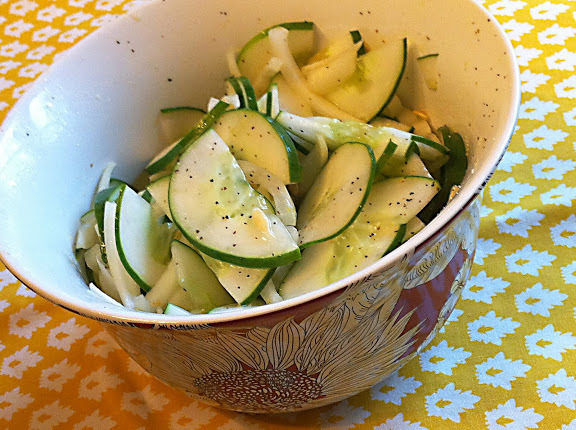 Since I have so many cucumbers growing from my garden, a yummy salad is a good way to use them up. I called my sister to give me a recipe, and she just whipped this out of her brillant brain. You know…throw a little of this on it, then a little of that and then you have a yummy salad. Throw it in a bowl and drizzle olive oil, red wine vinegar and agave syrup. Sea salt and pepper. I divided my garden bed into two sections for my early summer seeds and later summer seeds. The first section was for all my leafy vegetables. I didn’t put any black garden tarp underneath for weed control. For me, that was a bad thing. The weeds are out of control in that section and a daily chore. But I did put the black garden tarp in my second section and it make a huge differences in the number of weeds I get. Anyone have weed-control suggestions? 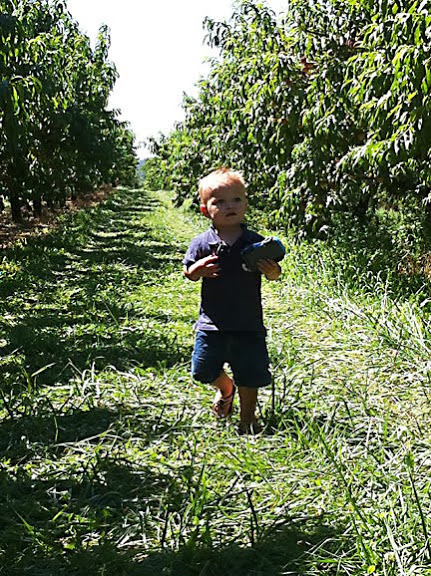 I have looked into pet friendly weed control services as I have my beloved pets to think about, so whatever I choose it needs to be pet friendly, but I thought I’d check to see if anyone had any helpful tips before I go down the route of hiring someone. When I left to go on my west coast vacation the first part of summer, I hired the neighbor boy to water my garden. That was kind of a bad thing. I should of hired someone who knew how to care for a garden. 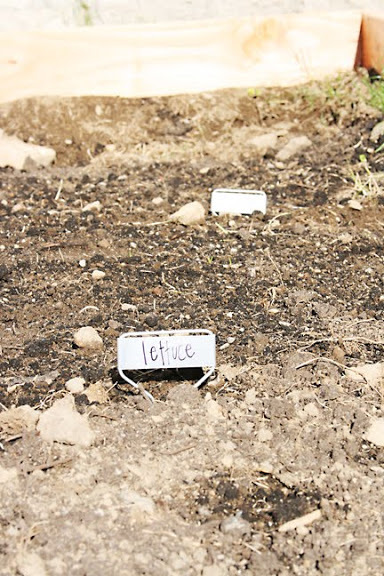 Not that he didn’t water because he did, but he didn’t do any weeding and ALL my leafy vegetables (lettuce, spring mix, green onions, and spinach) went to seed. So, what does going to seed mean? Well, for leafy vegetables it means that it hasn’t been cut down, but instead grown so large that it develops seeds. It declines in looks and status and most importantly TASTE. All my sweet mouth-watering lettuce now tastes bitter. And no–extra salad dressing does not cover the taste. Anyone have a solution for this? I’ve cut them down but they still taste bitter. I’m tempted to just pull it all up and try again next year. There’s a skunk that’s been hanging around the garden. I’ve spotted him a few times. I’m assuming there’s something in the garden he wants, but he hasn’t eaten any of the vegetables. Anyone have this problem? Any suggestions anyone can give? I’m thinking of planting some flowers in the sections that are done producing vegetables. Good idea? I’ve been lovin’ my vegetable garden. 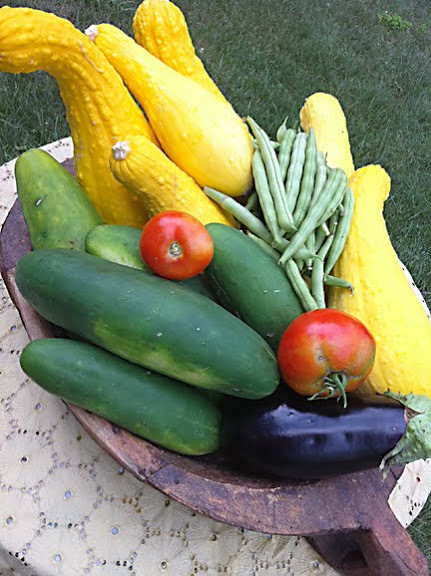 It’s been quite a delight, and I’ve been making sure that dinner always includes something from the garden. 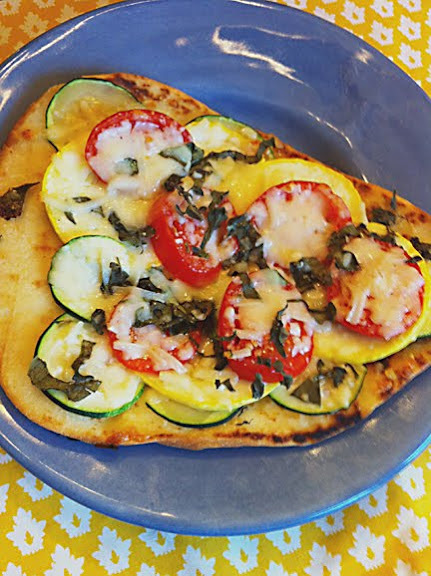 The latest dish that I’ve been scarfing down for the last two dinners (and lunch–yes it’s that good) is zucchini squash pizza. Fresh from the garden! I like to use Naan bread to make our homemade pizzas. Rub a little garlic olive oil on it, then sliced zucchini, yellow squash and tomatoes. Fresh basil and oregano bring out the flavor. Sprinkle sea salt and top with goats cheese. Bake in oven at 425 for 10 minutes. Yum! I’ve been toiling with the idea of joining up with a local coop farm. And when I found one that I liked, I was too late and now I’m on the waiting list for next year. Screw that! I’ll just grow my own vegetables. So, for the previous week my children’s adopted East Coast grandpa, who use to be a Vermont farmer, came to my house and helped me dig up part of our backyard and till the ground so I can have my own vegetable garden. We made it 20 ft by 6 ft so it’s a good size but still manageable. I planted the first of my crops last week. There’s nothing yet, but I went out there this morning and already see sprouts. Also, I went in with some other people and bought a grass-feed cow. I get the meat in a couple of weeks and it should last us a long time and save us money. Price out organic beef at the grocery store next time–it’s expensive! Next…backyard chickens. No joke…but that’s another post. Did you eat a lot of chocolate on Easter? Or like me, still eating chocolate? Okay, so I kind of got distracted from healthy eating or, as some like to say, dieting. 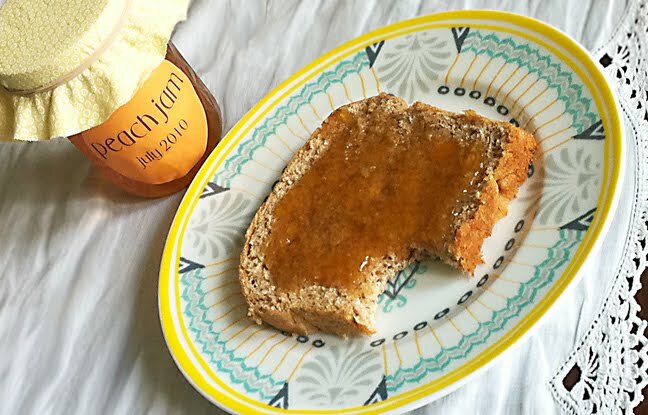 I’m back at it and just got back from the grocery store and ready to follow Simply Healthful’s two-week meal plan so I can shed those stubborn 5 lbs. If you click over to the post there is a grocery list and meal plan for two weeks to make it easy. Nothing is processed on the meal plan and lots of fresh, fresh food. The recipes are found in the “recipe” section of the blog. Now I’m going to go make me a Mango Coconut Delight. Need a way to get vegetables down your kids? 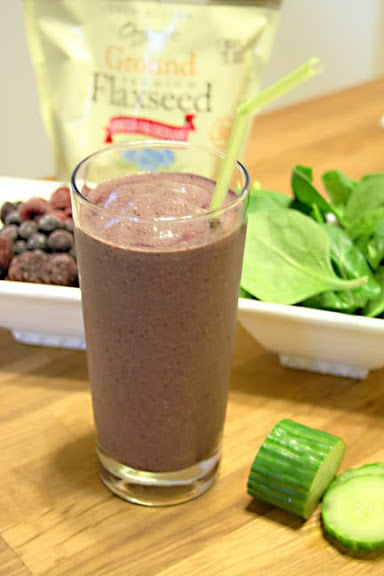 Make them a Blueberry Flax Shake. I’ve been making it every morning for a healthy way to jumpstart my day, and my kids beg for their own cup (straw included). My sister Marleen made up this recipe, and it’s so good and healthy and filling. And I promise–your kids won’t know that there are vegetables mixed in. Below is the recipe. Check out Simply Healthful for more healthy recipes. Bathing suit season is around the corner, so I’ve been uping my salad intake and lessening my daily carbs (at least trying!). 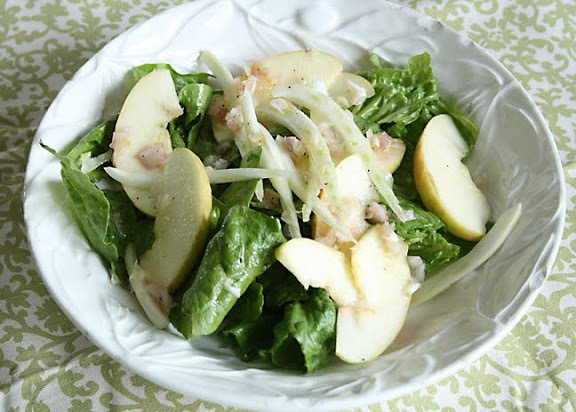 I really like this apple fennel salad. Not many ingredients and the dressing lasts a few salads.